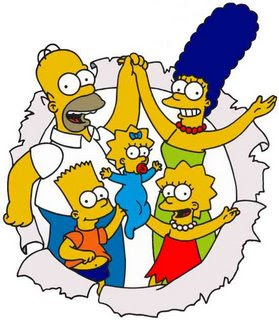 On the occasion of The Simpsons' 20th anniversary [a show I have known since the beginning, when it was part of The Tracey Ullman Show and I was just starting to date the man who would become The Best Husband Ever], I had all kinds of interesting thoughts this morning that I was excited to mold into a fascinating post for you, my faithful readers. But then I showered and started a load of laundry and went to church and did some antique store shopping and planned two trips to California and watched some football and forgot about the laundry and had tacos with my best friends and am now too tired to string a few potent words together. Your day sounds lovely so I will try not to hold it against you that you neglected your bloggy fans. Especially since I am now managing to post to my own blog about ONCE a week! But, I don't have readers hanging on my every word like you do, either;-) Duties, bad mom, duties!! A favorite refrain in our house..."Oh, Margie, you came in and found me a turkey, on my vacation away from workie!" Just one of the many jewels from these past 20 years! Isn't that amazing? I remember watching them on the T.U. show too. I had a toddler and an infant at the time. Oy. And a husband (now ex) who "didn't get" The Simpsons. In retrospect, I probably should have know the ex part was coming. Details on the Cali trips? Is San Diego on the itinerary? My husband is the one who has gotten me into the show, at least the first few seasons that we own. We have a box of Homer cereal in our bedroom though.